Sophsterlicious • UK Blog: » Accessorize Aztec Nails. In a recent haul I mentioned that I had finally got hold of the Aztec Illusion Polish from Accessorize. As soon as I got home with this, I was sat down painting my nails with it, it's just so awesome and pretty and when I wear it I am constantly admiring my nails!.. This polish is £4 from Accessorize, Superdrug, or the Accessorize website (although it's been out of stock for a while now.) .. It dries quickly, needs two coats for an opaque finish, and has a glossy finish. It didn't chip on me at all, which makes a change for my nails .. The tips did wear quite quickly though, but I don't use a topcoat (naughty me!) .. Overall I am uber impressed with it's unique colour and quality. It is a difficult one to capture, and this is the best picture of a whole load! The picture of the bottle above captures it well too. It is multi dimensional with flashes of pink, purple, green and gold. It really is eye catching and just stunning. I've heard good things about this polish, and it does indeed look lovely! 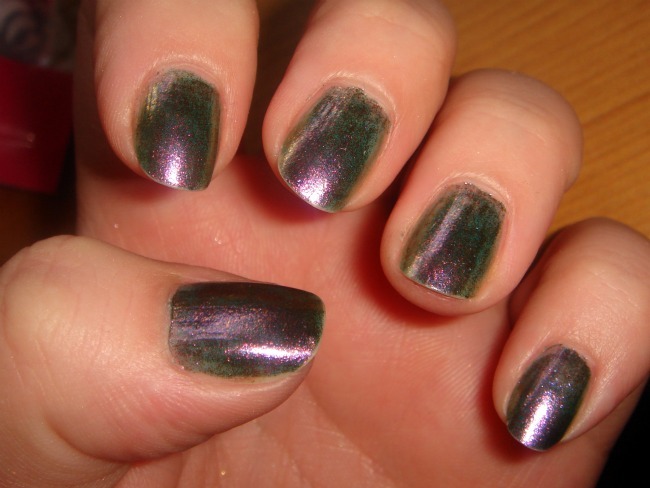 Very gorgeous but it looks just like Orly Space Cadet. → Liz Earle Energising Body Lotion. -- MeMeMe Correct + Perfect..
- Pretty Cheerful Nails ..
— Loving // Hating ..
» Dirty Works Face Mask & Scrub. —Free MUA Nail Polishes with Coca Cola! ٭ Sleek Primer Palette : Swatches. » Sleek MakeUP iDivine Primer Palette. → Who's a lucky girl? .. Cosmo Prize! » Nars Cordura Duo Eyeshadow. » My Thoughts : Nars Sheer Matte Foundation. « First Look! : Free Barry M Makeup Kit. ♥ Sleek MakeUP's Stiletto Collection.  Models Own Black Pearl Nails.  Garnier 7 Day Body Lotion. Dry Shampoo For Coloured Hair. « Get Yourself A Fabulous Face! - Free Barry M Makeup Kit! « Davina Peace : Body Care Review.